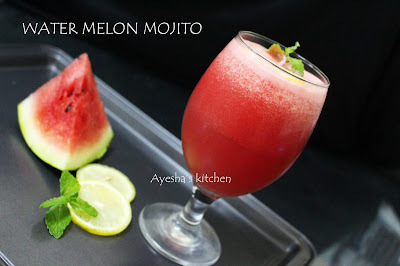 Watermelon Mojito is a quick thirst quencher in this hot summer. 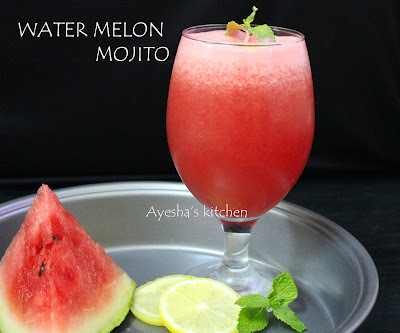 Thick watermelon juice with lemon juice, sugar syrup or sugar, mint and sprite topped with some ice cubes together gives a satisfying feel in this hot summer. It is best to serve as a welcome drink for parties and in some other occasions. There are many varieties of Mojito available like a strawberry mojito, virgin Mojito, pineapple mojito and so on. Virgin mojito is almost the same as Indian lime soda or lemonade or sarbat with few changes. 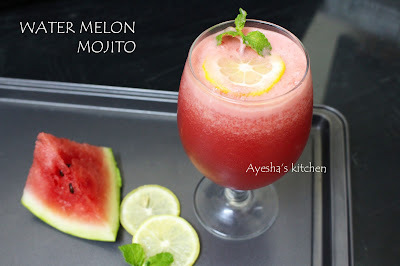 Nowadays Virgin mojito and watermelon mojito is served as an Iftar drink too which can attract guests and can quench the thirst after the long hours of fasting. Mojito is a traditional Cuban drink. Traditionally it is a cocktail consist of five ingredients such as white rum, sugar, mint, lime juice and ice cold water. But we can use any carbonated drinks like sprite instead of rum. Anyways it's a nice drink and my family really enjoyed having this after a day out. Do try this refreshing cool drink to beat the heat. Sugar - 2 tbsp, according to the sweetness of watermelon. You can also add sugar syrup. Sprite - 1 cup, or can add any carbonated soft drinks like sprite, Dew, 7up. In a blender, blend the seedless watermelon well. Once done, add lemon juice, mint leaves, and sugar. Again blend well and strain it into a bowl. Now pour into serving glass up to half of the glass. And fill rest of the glass with sprite or any such drinks. Top it with ice cubes, lemon slice and mint.